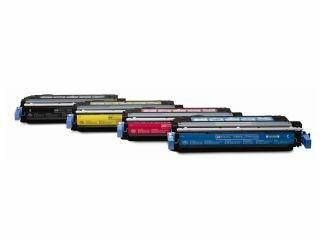 Hewlett-Packard (HP) is to make its printer cartridge packaging lighter and smaller in a bid to reduce the company's carbon footprint. It has redesigned the packaging for its printer cartridges to use more recycled and recyclable material. According to HP, the new packaging will reduce greenhouse gas emissions by 37 million pounds this year alone. The new, lighter design will apparently save 15 million pounds of materials throughout 2007, including 6.8 million pounds of polyvinyl chloride (PVC) plastic through material reduction, and substitution of recycled content plastic and paperboard. Shipping the cartridges will be more efficient due to the smaller size, and HP estimates that traffic for cartridge shipments in the US and Canada will be reduced by 1.5 million miles this year. HP said this was equivalent to taking 3,600 cars off the road. An HP LaserJet toner cartridge now uses 45 per cent less packaging than before, and a standard shipping palette can now fit in an average of 203 cartridges, instead of 144, HP said. According to the company, the overall package weight for its inkjet cartridge multi-packs has gone down by 80 per cent since 2003. Pradeep Jotwani, senior vice president at HP's supplies, imaging and printing group, said: "Developing environmentally responsible packaging is not only valued by HP, our customers and our partners; it is also good business." A spokesperson for HP in the UK said the smaller, lighter packaging would not initially be available in the UK. No information about possible reductions in price was given.